Evo-tec include a card saying the installation instructions are available on line but when you check out the s1000xr page there are no such details. If you check on the s1000r rad/oil cooler guard page on the Evo-tec site, they have instructions which should give you enough info to get the job done. I'll be fitting mine later on today and have d/l the s1000r instructions. 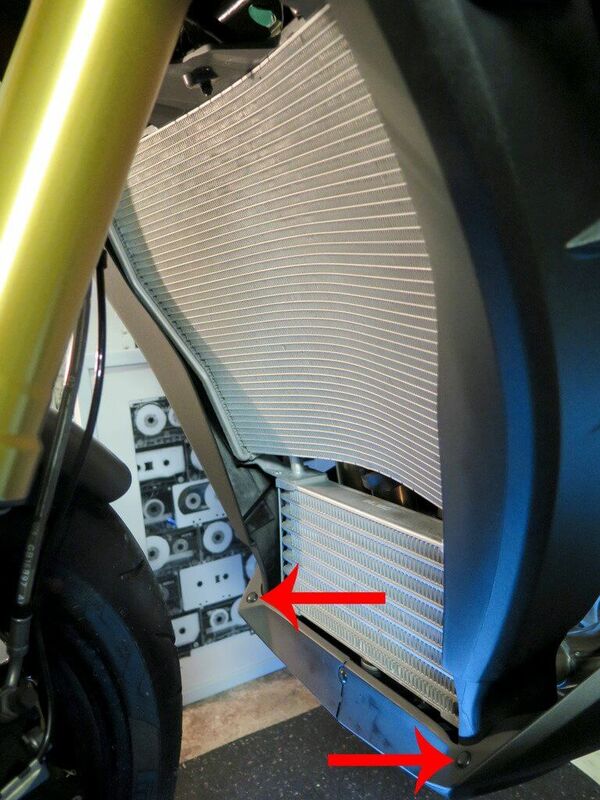 If you check on the s1000r rad/oil cooler guard page on the Evo-tec site, they have instructions which should give you enough info to get the job done. 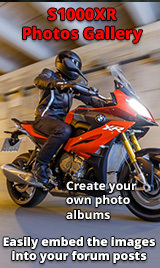 I'll be fitting mine later on today and have d/l the s1000r instructions. Thanks for the heads up. Hoping to fit mine later. Well, I didn't get very far! Had to use the S1000R instructions as a guide but, obviously, the bolts are in different positions. Loosened off all the bolts I could see but still couldn't get enough movement on the fairing. The corner studs on the bottom of the belly pan (arrowed) wouldn't budge at all. Had to abandon fitting until I've got a bit more time. The corner studs in your photo have a small plastic insert in the middle of them. It isn't very obvious but if you use a very small drift and lightly tap the centre of the stud the plastic insert will pop out allowing you to remove the fairing. Don't loose these small plastic plugs !! Remove the sides bolts and both bottom bolts of the cowling. Remove the cowling and you will see a hidden bolt which is holding the bottom of the fairing panel still. Remove this and you will have enough play to get the new covers in place. I struggled a little when lining the two covers together to get the bolt which screws into the bottom of the rad and holds them all together. Be patient and make sure they line up square as you don't want to cross thread these !! I've just fitted mine and it only took 45 mins. 45 minutes ?!? took me 2 hours and I had to walk away from it twice before I kicked it over, so kicked the cat instead !! Have to say, I'm a little disappointed with the fitting procedure and quality of the fit. The mounting "flap" on the right of the rad guard doesn't fit properly and has cut into the plastic on top of the radiator, as shown above. Anyone else find this? As a result, I've bent it up, out of the way. Surely it needs to be longer and better shaped or moved closer to the centre of the guard, where the plastic on the radiator is more recessed. The one to the left of the guard seems better positioned. Better still, why not just fix it with a mount that goes behind the fairing bolt to the right? Lining up both guards' screw holes between the rad & oil cooler is a pain and shouldn't be that difficult. A lot of the paint came off in the process too. Just fitted one of these guards, and it was a bit of a t**t, getting the holes to line up, but we got there, in the end. After I'd worked out how the fairing came off, my guards fitted perfectly. They do fit nicely & I have to say they look good.